Thanks guys , I now have the button in .xpm format, but how do I change buttons in icewm? I noticed my thinblack2 theme i'm using came with several. Heres the button if anyone else wants to use it. Thanks dejan, your artwork is some of the best. I'm still using your clockskin as you can see. AF Branden, it looks very nice. The black part can be made transparent so that it can go with different colored themes. Pa Penguin's Favorite IceWM Themes 2012: Several new themes (Aesthetech, bluePlastic21, Goldandsilver-18k, IceClearlooks2, pkde2) have been added since the 2010 version, and numerous other themes have been tweaked to make them a bit more colorful. Includes GoldenMood, QuanX, Velvet themes, Elberg themes, LightHeart themes, SmoothCopper, LiQuid, IceQua, Icemucha, and more. Screenshots and downloads (.pet and .tar.gz, approx. 2 MB) available at Pa Penguin's Icebox (http://www.pa-mcclamrock.com/themescheme.html). Thanks Tman for sharing that really nice theme! ( Red's my colour btw! ) That has a far "milder look" than the "glaring red" of the BT105 theme I've used in the past and so this will be enjoyable using when in the IceWM interface. Again Tman: Thanks for sharing. Keep up the fabulous work you've contributed to Puppy! @Pa: Once again, love your site as well my fellow Puppian friend! One of my favourite drop off spots whenever I have a bit of time to read, etc. Your love for Puppy and IceWM is truly wonderful to see. Thanks for sharing! I'm glad you like my theme and thanks for the nice comments, but I don't have a web-site so, it must be someone else with the same alias. That last line there was to Pa ( @Pa: ) as he has one great IceWM website. If you ever get the chance you aught to click his link and visit for awhile. Not only does he have a literal mound of info regarding the Ice window manager but the man is a virtual storehouse and authourity on tcl/tk programmes/programming, sharing many wonderful and helpful little apps from his site. I have it optimised for netbook use, where on maximising a window the title bar is hidden, and with a collapse taskbar button. If you would like these features, there is a prefoverride file inside the folder, which you can copy to your ~/.icewm directory or merge with your existing one. 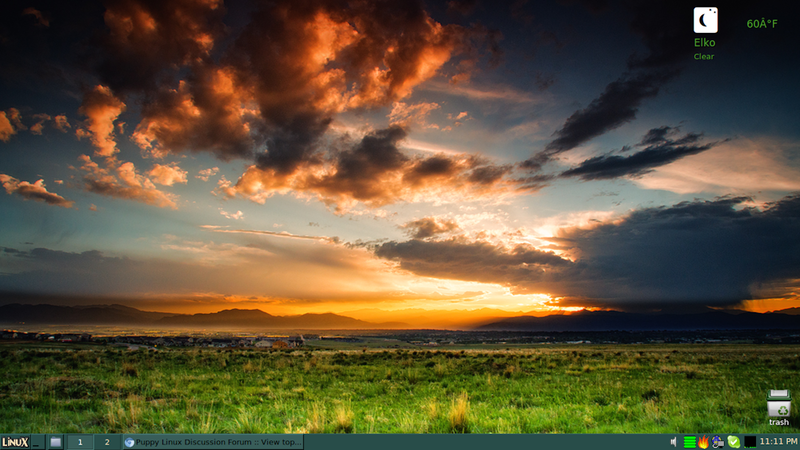 This also moves the taskbar to the top. Simply extract LeopardEyes.tar.gz in ~./icewm/themes. Description Shows what maximised window looks like. Here is my minimalist Icewm desktop on Lupu 5.2.8. Posted: Sat 07 Jul 2012, 02:15 Post subject: how to change the folder window icon in the taskbar? Now had like to change the icon of the folder window wich is displayed along in the taskbar whenever a window is opened (hide/show Taskbar window icon enabled in the icewm configutation menu). Please tell me how to install the themes in icewm. it'll show up immediately under menu->settings->themes. The JWM version is mostly the same as the Openbox one, except with round corners.